3000Grad Records » 3000Grad035 “MOLLONO.BASS & AVA ASANTE“ Birds Flying High – Part One E.P. 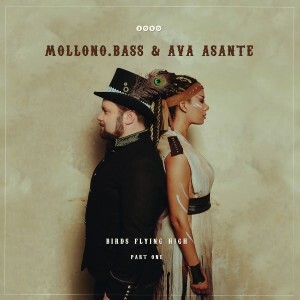 h1>3000Grad035 “MOLLONO.BASS & AVA ASANTE“ Birds Flying High – Part One E.P. Summer, Sunshine, Feeling Good – for their long desired debut album Mollono.Bass & AVA Asante take this great essence of life to compose a unique kind of electronic music. By combining the catchiness of their solid grooves with a touching violin and a breathtaking voice they create a magical journey that will make you feel like BIRDS FLYING HIGH. While some tracks are bursting with euphoria, others swing along with dubby easiness – and all of them will touch your soul deep inside.